Mega•Crafty: How do you eat an elephant? That's what the mister always tells me when I'm facing a big project that seems never ending or overwhelming. The point is if you just take it one manageable piece at a time you can accomplish anything. 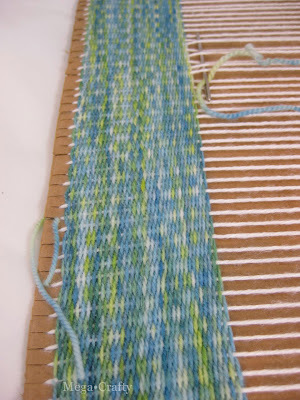 This weaving project is the epitome of that saying. 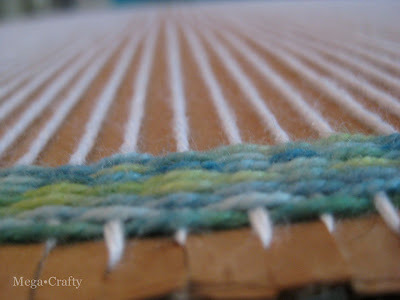 It seemed so daunting when I started that first lonely little row- I had so much more to do! Even a dozen or so rows in it felt like this project was going to be huge. I'm a quarter of the way done! Now that I have some built up I can really see how the colors are starting to mix and line up with each other to form patterns. I love watching that random aspect unfold before my eyes. Seems like that elephant is going down well! I love these colors you are using! Thank you ladies! I love to read both your comments. I'm so happy you both took the time to leave them!!! 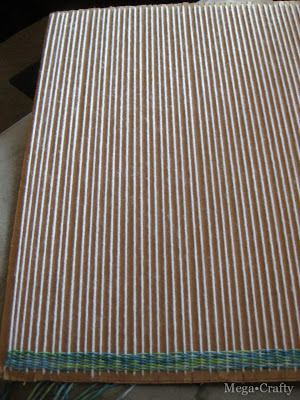 Lisbonlioness- I can't wait to see your weaving project. I know you were also a big fan of Pam's tutorial! Thanks for leaving a comment Kookie. I like that- what can't be cured must be endured. I've never heard that before. 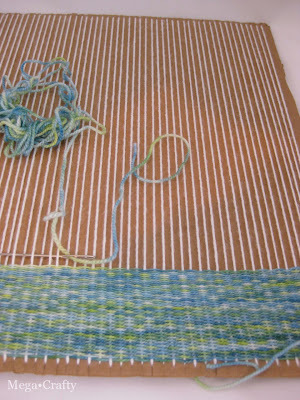 The weaving project is fun- and relaxing... but the idea of it being so big seemed daunting until I took the "elephant approach". You have more restraint than I do... my eyes are usually bigger than my abilities when it comes to crafting- LOL. I would NOT say that your eyes are bigger than your crafting abilities! Time available - well maybe! But you are taking it slow and not in a hurry to finish so you will get there. I love the emerging pattern and color play too. Always my favorite part. Thank you so much for sharing your progress on this gigantic piece! I will stick to my little 8x10's!